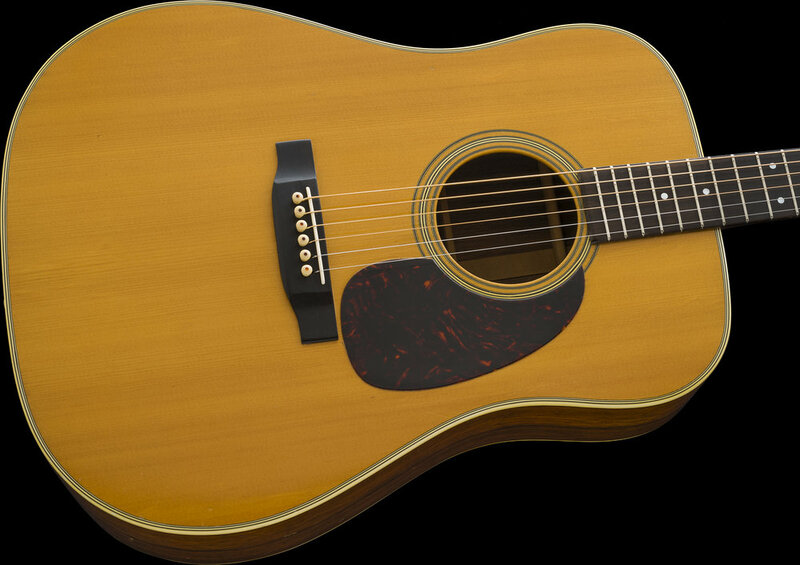 The D-28 model Martin has become THE iconic large body acoustic guitar on our planet. 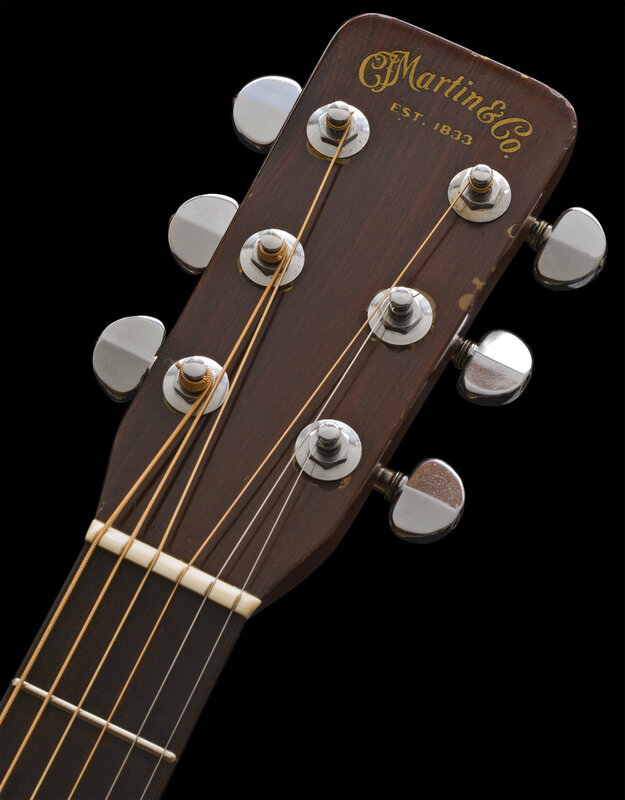 Initially introduced in 1931, the Dreadnought model was developed by Martin to meet a demand for a guitar with full tone and volume which was helpful for the accompaniment of vocals and other instruments. These larger bodied guitars are capable of producing full range sounds and warm, round bass frequencies. The materials that were chosen and used throughout its history became the benchmark. This particular era features an African Ebony fingerboard and bridge, a 1-piece Mahogany Neck with metal T-rod, a tight-grained, free of defects Sitka Spruce top that was hand-picked by Martin's expert factory craftsmen, a grainy and beautiful book-matched Brazilian Rosewood back and sides and a set of friction-free Grover Rotomatic tuners. Additionally, 1965 is the first year of the Drop-In style bridge saddle and one of the last years that Tortoise Shell plastic pickguards were utilized on regular production models before switching to the thin Black acetate material. The adornment of a black pickguard is a practice that continues on the model today. During the 1980's, Tortoise Shell plastic began to reappear on some of the Reissue and Limited Edition models. The 1965 bridge plates are made of Maple, the factory changed that feature and started using Rosewood plates in 1968. I have examined, tested, serviced and set-up this instrument and found it to be factory-correct and unmolested in every way. The guitar plays very nicely, and the neck is in healthy condition as are the frets. This one is so nicely preserved, both the Top and the Body are crack-free, and luckily, no one has ever installed a neck heel area "strap button," a personal peeve of mine. This guitar has aged gracefully and has a very warm patina and vibe. The appearance and coloring of the top, which is a pleasing and even toned natural Amber, this is a look that new guitars can only aspire. The combination of age, materials, and condition, all contribute much to the guitar's overall curb appeal. These Brazilian beauties have always had a very high desirability factor. There is some normal but minor amount of binding shrinkage around the sound hole, and the guitar exhibits usual marks and artifacts globally from minor usage during its lifetime. The VICTORIA CASE is an original and correct and has the expected Black Tolex and Blue lining. It is in very good structural and cosmetic condition. It shows some minor, normal wear and has a fully functional handle, additionally, all of the latches and hinges are working and are healthy. I often don't attempt to describe SOUND. I find it challenging and difficult to describe whether or not any guitars' sound is "GOOD." That seems hugely dependent on each players touch, approach, expectations and their own criteria. In other words, if I say that this one really sounds great or is really "rocking" (as many vendors do), I feel it has NO useful value to prospective buyers. Since it's my opinion and I certainly could be biased as the "seller," I believe that only we as individuals can decide if something is to our liking or works for us. So I will spare you the silly-seller hype of which I too don't appreciate reading, I see no value or help in that type of approach. I acquired this beautiful D-28 long ago, more than 25 years. Back when this first came into my possession, I realized just how good of an instrument it is as well as it's overall attractiveness. I purchased this guitar as store inventory and eventually offered it to a Grammy awarded recording artist and friend who bought it to take on a tour. Very shortly after the sale, he returned and said, "this guitar is amazing, but I am afraid I will destroy it having it out on the road," and he proceeded to trade it back to me for some other more road-worthy instruments. Since it had come back and I admired it, I decided to keep it at that point, and never showed it again until today. With the level of difficulty in obtaining legal Brazilian Rosewood for production instruments, a new replacement guitar today, of similar ilk, will cost well into the 5 figure range as manufacturers struggle to source the woods to offer them. This guitar is now 53 years old and has been in my collection for more than 25 years and has been spared all of the "circulation" that most vintage instruments being offered online today have undergone. The chance to purchase an uncirculated and unmolested example of this caliber could prove very difficult today, so please inquire. Weight: 4 lbs. 10.2 oz.